The picture is poor quality; Sorry -- I'm not a woman to spend a lot of money on expendable items like phones. Unlike the lunk of black pastic in my purse, however, the people here at the conference are high quality examples of type. They are what human beings can be when they spend decades helping people in need. We're meeting at the Williams Inn in Williamstown, a half block from the campus of (the very pricey, very haute) Williams College. The contrast between the herd of (rather casually dressed) Pastoral Counselors and the usual demographic that walks through the inn's doors is in sharp relief. While waiting in the lounge I was entertained by an assortment of foreign accents, a couple of pretty ladies wishing each other bonne nuit, and a clatch of artists from New York. EVERYONE HAS GREAT HAIR. EVERYONE IS WEARING AN EQUISITE COAT. Then there were the youth of a few comfortable families who didn't have the class to teach their kids not to give strangers appraising and then dismissive looks. These last few make me smile...why? Because they are unafraid to show their faults to the world, I guess. There's something childlike and (almost) charming in that. Into this lux milieu thunder the Pastoral Counselors. Yes, we have clunky shoes and wear way too much corduroy. Terrible posture, some of us. Cheap haircuts A couple I swear are The Car Guys. Yes, we're not a pretty bunch. Most of these folks have spent decades working with people whose histories, addictions, or neurology have brought them low. They've walked door to door in ghetto neighborhoods gathering people in for meetings. Done pro bono work with those who can't pay. Given actual cash out of their pockets to clients who have a real need -- in secret because the accepted best practices of the counseling world absolutely forbid this kind of engagement. When other counselors work hard to keep an emotional distance between themselves and the client, these guys move forward. They bridge the gap. Close the space between people. That's radical. 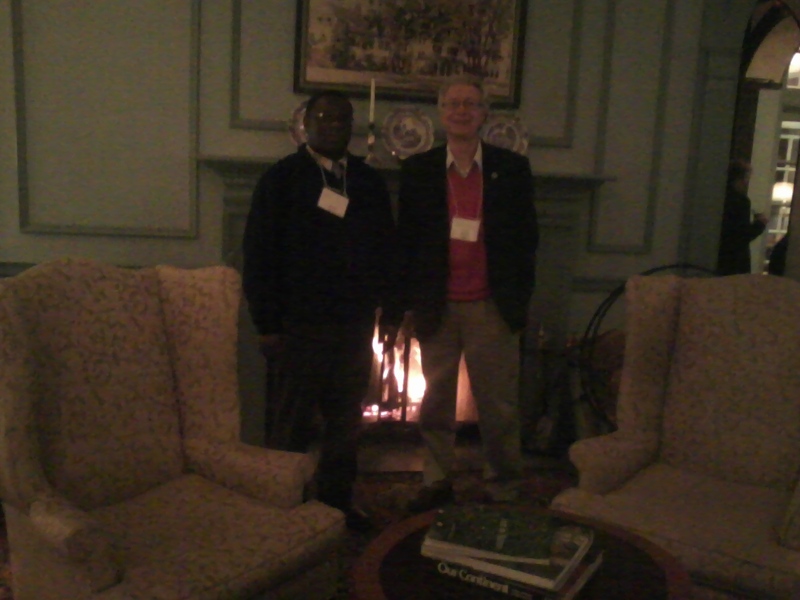 In the picture below are two friends -- the one on the left, Edward Matuvunye, is my classmate at Andover Newton. The guy on the right is Jon Wills whom I just met, briefly, to night. I should go on here and give you their stories, but it's late, and I'm bushed. Tomorrow, maybe? Until then, good night.